The canter work is even more significantly improved. This effort is probably described best as "trying not to fall off the damn horse." I'm so proud of us. Round, good contact, quality gait, and I'm sitting nice and tall. Go us! I’m not sure why we’re suddenly producing better quality work – and to this degree. – It has been cool and breezy, and a little wind under his tail might be propelling the Derbster forward. – We’re in a different bit and he is definitely taking stronger contact on it. – The vet says I gotta do it. I’m sure these are all contributing factors, though none explain my new found ability to sit my transitions. I guess I’ll quit ruminating and just take it. So tonight Derby really worked. We started with the longing program prescribed by the vet, and then had a lesson about 45 minutes later. We took advantage of the empty arena to really encourage Derby to move out, both at the trot and canter. 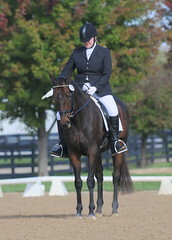 Leg yields and trot quality were the focus of the first half of the lesson. Christy had me ride the arena like a rectangle on the quarterlines, cutting straight across the short end and yielding out on each side. As we went through the exercise, Derby got more and more connected, which really is no surprise, given that I was half halting him through every corner, and again as we started the yields. Feeling the contact get stronger and his back come up up up was really cool. For the canter work, the aim was to ride more forwardly and let Derby roll around the arena. However, we were both starting to run out of gas toward the end. We did get some nice quality work, though not as big and forward and rolling as I had hoped. We’ll give that another shot tomorrow! After the ride I made a big fuss out of Derby, plying him with carrots, cookies, peppermints and an alfalfa mash. I think we’re friends again (he wasn’t thrilled when I saddled him up apres longing) and I’m looking forward to tomorrow night! 3 Responses to Mind Over Matter? Maybe? Have you learned something about using your core? Because you look like you are tightening different ab muscles… which makes a HUGE difference in everything you do! Regardless of what it is, you look great! Sometimes taking a break just lets ideas percolate and develop, too. It rarely hurts. You’re looking so much better. Hooray!